Analysis: Nearing the end of a lost season, Jacksonville may opt for a cautious approach with its veteran RBs. If both Fournette (as expected) and Hyde land on the inactive list, Williams and Yeldon would be the remaining options at running back. In five brief appearances this season, Williams has notched 34 yards on six carries and gone without a target. 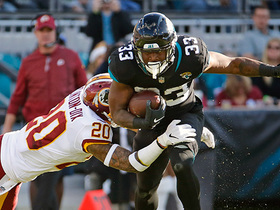 Analysis: Even with T.J. Yeldon sitting as a healthy scratch, Williams did not touch the ball as Leonard Fournette piled up 21 touches and Carlos Hyde added eight. The rookie was solid in limited action in Week 15 against Washington, but evidently still finds himself no higher than third in the pecking order. Even if he gets more action in the season finale, a league-best Houston run defense should give him and his stablemates some problems. Analysis: Coach Doug Marrone said after the game that Williams has shown well at practice and the team was looking to "see what he can do," John Oehser of the Jaguars' official site reports, as he had only one carry for the season entering Sunday. Carlos Hyde -- who was acquired in October for a fifth-round pick -- was a healthy scratch against Washington, so it appears Williams may serve as the team's No. 3 running back for the closing stretch. Analysis: As expected, with Corey Grant (foot) headed for injured reserve and Leonard Fournette (hamstring) still out for at least another week or two, Williams will join the Jaguars from Denver's practice squad to bolster the team's depth at the position. He will likely be the No. 3 running back for the time being with T.J. Yeldon and newly-signed Jamaal Charles operating as No. 1 and 2, respectively. Williams is expected to sign with Jacksonville, Ryan O'Halloran of The Denver Post reports. Analysis: Williams' expecting signing comes on the heels of Jacksonville's depth issues at the position. With the news of Corey Grant (foot) headed to IR, the Jaguars are in the market for a depth running back. It's tough to speculate what type of role Williams could have with the offense, but the expectations should be set low given his youth and unfamiliarity with the system. 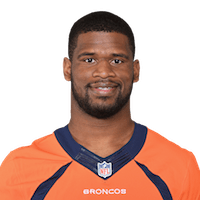 Williams was released by the Broncos on Saturday, Nicki Jhabvala of The Athletic Denver reports. Analysis: With Williams and De'Angelo Henderson both handed pink slips, Phillip Lindsay is left as the No. 3 RB behind Devontae Booker and Royce Freeman. It won't come as any surprise if the Broncos make room for Williams on their practice squad.